Figure 3.12. 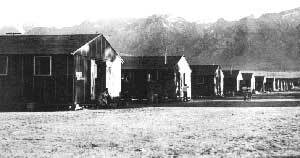 Evacuee barracks at the Manzanar Relocation Center. The physical surroundings, while not having as profound an impact as political and philosophical issues, had a great effect on everyday life. When the evacuees arrived at the camps, they found identical blocks of identical flimsy barracks (Figure 3.12). They quickly improved and personalized their new lodgings, first to make them habitable, and later to make them into homes. The physical changes the evacuees made in their environment were important ways of taking control over their own lives. The changes also helped personalize the identical barracks, to relieve the monotony. Physical elements could also be reminders of their lack of freedom. The guard towers and especially the barbed wire fences delineated the difference between inside and outside the camps, freedom and confinement. Even a WRA re port admits this: "... the contrast between the barbed wire and the confinement within Manzanar and the observable freedom and motion for those immediately outside, is galling to a good many residents" (W.R.A. 1943). The weather was another element that greatly affected the evacuees' lives. Both contemporary and later accounts stress dust, mud and extremes in temperature that came as great shocks to West Coast residents used to much more temperate climates. The dust, caused by the massive disturbance of the soil from construction of hundreds of buildings at once, eventually settled, but the harshness of the climate stayed the same. Originally, block leaders were appointed by the relocation center director. But, the WRA decided that the evacuees should participate in governing their own communities as much as possible. WRA policy called for a community council with one elected representative from each block, an executive committee, and a judicial committee. Issei were not eligible to hold an elective office. Manzanar was the only center that never elected a council. Instead it relied on elected block leaders who served as an advisory group for the center director (Myer 1971:39-40; Smith 1995:253). Some conflicts within the Japanese American community were caused by relocation, while others were merely brought to the surface. Many Japanese Americans had supported the United States and were loyal and patriotic until their government decided that they were untrustworthy and guilty until proven innocent. Their feelings of betrayal sometimes caused formerly loyal citizens to renounce their citizen ship, in extreme cases, or merely to sympathize with the Japanese government. It was probably most difficult for the Issei, who often still had feelings of loyalty to Japan, even though they also felt American. Other Japanese Americans continued to feel loyal to their country, even though they had lost their homes and freedom. Their major goal was to find ways to prove their loyalty to the outside world. Inter-generational tension was also a major problem in the relocation centers, especially since Issei and Nisei were very distinct generations. There was a large shift in the balance of power from the Issei to the Nisei, for many reasons. The majority of the Issei leadership had been arrested after Pearl Harbor, and the Nisei gained power and influence, both within families and in general. Once the relocation centers were set up, many of the Issei were released to join their families in the centers. However, use of the Japanese language was very restricted: all meetings had to be con ducted in English, and all newsletters and other publications were in English. Since many Issei did not speak English, or were not very fluent, this was a further handicap. The Issei also often lost more in the arrests and relocation, since they usually had established farms or businesses. The Nisei usually had less to lose, and some saw the entire experience as an adventure or merely a temporary setback. Resistance within the relocation centers took many forms. Ethnic churches, Japanese language schools, and unofficial unions flourished. More overt resistance came in the form of strikes and protest demonstrations. How far these went depended on whether an acceptable compromise could be reached (Okihiro 1974). In November 1942 Heart Mountain was beset by protests over the erection of a barbed wire fence and watchtowers around the relocation center. A petition signed by over half of the adults in the center stated that the fence was an "insult to any free human being." The fence stayed, but the protests continued (Daniels 1989:115). That same month Poston came close to open revolt. When two suspected informers were beaten, administration officials arrested two Kibei men. Crowds demanded they be freed, workers went on strike, and the police station was picketed. Demonstrators flew flags that from a distance resembled the Japanese flag. However, the protest ended peacefully as the Issei leaders of the protest saw things getting quickly out of hand and a compromise settlement was reached. The most serious disturbance erupted at Manzanar in December 1942, following months of tension and gang activity between Japanese American Citizens League (JACL) supporters of the administration and a large group of Kibei. On December 6, a JACL leader was beaten by six masked men. Harry Uneo, the leader of the Kitchen Workers Union, was arrested for the beating and removed from the center. Soon afterward, 3,000 to 4,000 evacuees held a meeting, marched to the administration area, and selected a committee of five to negotiate with the administration. In exchange for a promise of no more demonstrations, the center director agreed to bring Uneo back to the relocation center jail. However, when Uneo was returned a crowd formed again. Fearing the worst, the director called in the military police, who then used tear gas to break up the crowd. When a truck was pushed toward the jail, the military police fired into the crowd, killing one and wounding at least ten others (one of whom later died). A group of 65 "outspoken patriots" (Myer 1971:64) who supported the Manzanar administration were on a reported death list, including the JACL leader who had been beaten. For their protection, these evacuees were removed to an abandoned CCC Camp in Death Valley. Sixteen alleged troublemakers, including Uneo, were removed to local jails and then to another abandoned CCC Camp at Moab, Utah. This so-called "Isolation Center" was later moved to an Indian boarding school at Luepp, Arizona, in April 1943. Others from Manzanar and other relocation centers were also sent to the Isolation Center, for "crimes" as minor as calling a Caucasian nurse an old maid (Drinnon 1987:104). No formal charges had to be made, transfer was purely at the discretion of the relocation center director (Myer 1971:65). At Luepp, the military police outnumbered the inmates 3 to 1. The Minidoka Center was continually plagued by strikes and protests. The evacuees organized a labor council, termed the Fair Play Commit tee, to represent them. The main objection was the low wage scale and the difference in wages between the evacuees and the Caucasian staff. A strike by evacuee coal workers was broken by employing other evacuees from the center who volunteered, and a strike by hospital workers was broken by sending the strike leaders to Luepp. Similar conflicts later arose with block maintenance staff, mail carriers, gatekeepers, telephone operators, warehouse workers, and other groups. A never-finished gymnasium stood as a reminder of administration-evacuee conflict. The construction crew walked out over a dispute about work hours and no volunteers could be found to replace them (Sakoda 1989:263). Even with suspected troublemakers shipped out at a moment's notice, a crisis could erupt at anytime, as at the Topaz Relocation Center. On Sunday, April 11, 1943, 63-year-old James Hatsuaki Wakasa was fatally shot just before sunset by military police. Either distracted or unable to hear or understand the sentry's warnings, he was near the perimeter fence about 300 feet from the watchtower, when he was shot in the chest. The sentry, a disabled veteran of Pacific combat, claimed that Wakasa was trying to crawl through the fence and that he warned him four times before firing a warning shot (guards had fired warning shots on eight previous occasions). The relocation center residents were shocked and outraged by the killing and a general alert was called by the military in case of trouble. However, relative calm prevailed as both the administration and the Topaz Japanese American leadership wanted to avoid a confrontation. After a brief work stoppage, compromises on the funeral location (near, but not at, the spot of death) and limits placed on military police were reached. The military were subsequently restricted in their use of weapons, no MPs would be allowed inside the center, and Pacific veterans would be withdrawn and no more would be assigned. Nevertheless, a little more than a month later, a sentry fired at a couple strolling too close to the fence (Taylor 1993:141).